More about fabric choices for your sofa. Our previous blog post we talked about fabric – how to determine the quality of the fabric you’re considering for your new sofa. But the most important consideration merits a blog all its own, and that is the safety of the fabrics you’ve chosen. We define “safe” as a fabric that has been processed with none of the many chemicals known to harm human health – and in a perfect world we’d throw in water treatment and human rights/labor issues too. Organic production has a strong social element and includes many Fair Trade and ethical production principles. As such it can be seen as more than a set of agricultural practices, but also as a tool for social change . For example, one of the original goals of the organic movement was to create specialty products for small farmers who could receive a premium for their products and thus be able to compete with large commercial farms. But even if you start with organic natural fibers (a great choice!) but process those fibers conventionally, then you end up with a fabric that is far from safe. Think about making applesauce: if you start with organic apples, then add Red Dye #2, preservatives, emulsifiers, stabilizers and who knows what else – do you end up with organic applesauce? The US Department of Agriculture would not let you sell that mixture as organic applesauce. There is no similar protection for consumers when buying fabric, even though the same issues apply, because over 2000 chemicals are used routinely in textile processing. Many of the chemicals used in textile processing have unknown toxicity, and many others are known to be harmful to humans (such as formaldehyde, lead, mercury, bisphenol A and other phthalates, benzenes and others). In fact, one yard of fabric made with organic cotton fiber is about 25% by weight synthetic chemicals – many of which are proven toxic to humans  and are outlawed in other products. We know formaldehyde is bad for us, but in fabric? A study by The National Institute for Occupational Safety and Health found a link in textile workers between length of exposure to formaldehyde and leukemia deaths. Note: most cotton/poly sheet sets in the U.S. are treated with a formaldehyde resin. Women who work in textile factories which produce acrylic fibers have seven times the risk of developing breast cancer than does the normal population. A study in France revealed a correlation between the presence of cancer of the pharynx and occupation in the textile industry. A high degree of colorectal cancer, thyroid cancer, testicular cancer and nasal cancer has been found among textile workers, and a relationship between non-Hodgkin’s lymphoma and working in the textile industry was observed. The Mt. Sinai Children’s Environmental Health Center published a list of the top 10 chemicals they believe are linked to autism – and of the 10, 6 are used in textile processing and 2 are pesticides used on fiber crops. .
Greenpeace did a study of children’s wear sold by the Walt Disney Company – you know, like those cute Tinkerbell pajamas? Turns out that of the 5 chemicals they tested for, most items tested had far more of the chemical than is considered safe. Are these rates of disease and the corresponding rise in the use of industrial chemicals a coincidence? Are our increased rates of disease due to better diagnosis? Some argue that we’re confronting fewer natural pathogens. All plausible. But it’s also true that we’re encountering an endless barrage of artificial pathogens that are taxing our systems to the maximum. And our children are the pawns in this great experiment. And if you think artificial pathogens are not the main culprits, your opinion is not shared by a goodly number of scientists, who believe that this endless barrage of artificial pathogens that is taxing our systems to the max has replaced bacteria and viruses as the major cause of human illness. We don’t have to debate which source is primary; especially because, with the rise of super bugs, it’s a silly debate. The point remains that industrial pollution is a cause of human illness – and it is a cause we can take concrete actions to stem. Textiles are the elephant in the room – the industry is global, relatively low tech, and decentralized – certainly not the darling of venture capitalists who look for the next big thing. So not many research dollars are going into new ways of producing fabrics. Most of the time people are looking for the lowest price fabric for their projects or products – so the industry is on a race to cut costs in any way possible: in 2007, the Wall Street Journal’s Jane Spencer detailed the pollution caused by Chinese textile industries who were being pushing by their multinational clients to cut costs, resulting in untreated effluent discharge . You can begin to protect yourself by looking for fabrics that have third party certifications: either Oeko-Tex or The Global Organic Textile Standard (GOTS), which we believe is the gold standard in textiles because though Oeko-Tex assures you of a safe fabric and while GOTS confirms the same assurance, GOTS also requires water treatment (important because the textile industry is the #1 industrial polluter of water on the planet (14) – and in this era of water shortages we have to start paying attention to our water resources) and prohibits child or slave labor (sadly still an issue) and makes sure workers have safe conditions to work in and are paid fair wages. Pinkerton, LE, Hein, MJ and Stayner, LT, “Mortality among a cohort of garment workers exposed to formaldehyde: an update”, Occupational Environmental Medicine, 2004 March, 61(3): 193-200. Haguenour, J.M., “Occupational risk factors for upper respiratory tract and upper digestive tract cancers” , Occupational and Environmental Medicine, Vol 47, issue 6 (Br J Ind Med1990;47:380-383 doi:10.1136/oem.47.6.380). Spencer, Jane, “China Pays Steep Price as Textile Exports Boom”, Wall Street Journal, August 22, 2007. 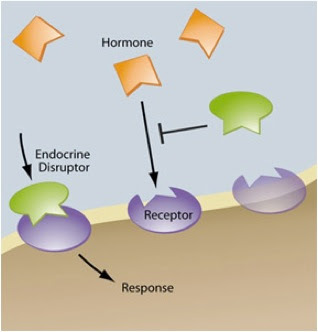 Why are “endocrine disruptors” a concern? In 2012, Greenpeace analyzed a total of 141 items of clothing, and found high levels of phthalates in four of the garments and NPE’s in 89 garments – in quantities as high as 1,000 ppm – as well as a variety of other toxic chemicals. Phthalates and NPE’s are among the chemicals known as “endocrine disruptors” (EDCs) – chemicals which are used often and in vast quantities in textile processing. Diabetes, a condition in which the body does not properly process glucose, is an endocrine disease, as is hypoglycemia and thyroid cancer. According to the Centers for Disease Control (CDC), 29.1 million people have diabetes. The three types of diabetes are a good illustration of the two main ways that something can “go wrong” with hormonal control in our bodies. In type I diabetes, his/her pancreas is unable to make insulin. Without insulin, the liver never “gets the message” to take glucose out of the bloodstream, so blood glucose remains too high, while the stores of glucagon in the liver are too low. In type II diabetes, the person’s pancreas is making enough insulin, but the insulin receptor sites on the liver cells are “broken” (possibly due to genetic factors, possibly do to “overuse”) and cannot “get the message.” Because the liver is unable to receive the instructions (despite the presence of lots of insulin), it does not take glucose out of the bloodstream, so blood glucose remains too high, while the stores of glucagon in the liver are too low. In type III diabetes (AKA Alzheimer’s Disease), it is the neurons in the brain, specifically, which “don’t get the message,” (though it sounds like researchers have yet to determine whether that’s due to lack of the brain-produced insulin upon which they depend, or whether that’s due to receptors on the neurons that either are or become “broken”) and thus, cannot take in the sugar that they need, with the result that, without an alternative fuel source such as medium-chain triglycerides, the neurons will starve. Over the past 60 years, a growing number of EDC chemicals have been used in the production of almost everything we purchase. They have become a part of our indoor environment, found in cosmetics, cleaning compounds, baby and children’s toys, food storage containers, furniture and carpets, computers, phones, and appliances. We encounter them as plastics and resins every day in our cars, trucks, planes, trains, sporting goods, outdoor equipment, medical equipment, dental sealants, and pharmaceuticals. Without fire retardants we would not be using our computers or lighting our homes. Instead of steel and wood, plastics and resins are now being used to build homes and offices, schools, etc. A large portion of pesticides are endocrine disruptors. What this constant everyday low-dose exposure means in terms of public health is just beginning to be explored by the academic community. We have learned over time that many chemical substances can cause a range of adverse health problems, including death, cancer, birth defects, and delays in development of cognitive functions. For instance, it is well established that asbestos can cause a fatal form of lung cancer, thalidomide can cause limb deformities, and breathing high concentrations of some industrial solvents can cause irreversible brain damage and death. Only relatively recently have we learned that a large number of chemicals can penetrate the womb and alter the construction and programming of a child before it is born. Through trans-generational exposure, endocrine disruptors cause adverse developmental and reproductive disorders at extremely low amounts in the womb, and often within the range of human exposure. Age at time of exposure is critical. 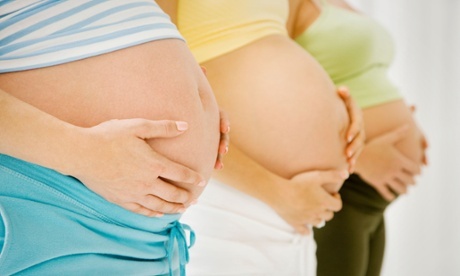 There is even a new terminology to explain the consequences of exposure to EDCs: “the fetal basis of adult disease”, which means that the maternal and external environment, coupled with an individual’s genes, determine the propensity of that individual to develop disease or dysfunction later in life. This theory, known as the “developmental origins of health and disease,” or DOHad, has blossomed into an emerging new field. DOHad paints a picture of almost unimaginably impressionable bodies, responsive to biologically active chemicals until the third generation. The developmental basis of adult disease also has implicit in its name the concept that there is a lag between the time of exposure and the manifestation of a disorder. In other words, the consequences of exposure may not be apparent early in life. Exposures don’t happen alone – other pollutants are often involved, which may have additive or synergistic effects. Even infinitesimally low levels of exposure – or any level of exposure at all – may cause endocrine or reproductive abnormalities, particularly if exposure occurs during a critical developmental window. Surprisingly, low doses may even exert more potent effects than higher doses. EDCs may affect not only the exposed individual but also the children and subsequent generations. TEDX (The Endocrine Disruption Exchange, Inc.) is the only organization that focuses primarily on the human health and environmental problems caused by low-dose and/or ambient exposure to endocrine disrupting chemicals. TEDX’s work is prevention driven, and it is the only environmental organization that focuses on the problems associated with endocrine disruption attributable to synthetic chemicals found in the general environment. While there are other national, international, and local organizations that address the public health and environmental consequences of toxic chemicals in the environment, none of them expressly emphasize endocrine disruption. By mainly focusing on substances in the environment that interfere with development and function throughout all life stages, TEDX has one of the most complete databases in the world on this topic, available for those concerned about public health and environmental quality. This database was developed because traditional toxicological protocols have used high doses on fully developed tissues and individuals that heretofore missed the consequences of chemical substances on developing tissues. TEDX is unique because it focuses on the damaging activity of chemicals on biological systems from an entirely new approach. This new approach focuses on the effects of very low and ambient levels of exposure on developing tissue and resulting function before an individual is born, which can lead to irreversible, chronic disorders expressed at any time throughout the individual’s life. Endocrine disruption takes into consideration the vulnerability of every individual in the population during their most vulnerable life stages. By providing this unique perspective on the actions of endocrine disruptors, TEDX fills in the very large gap in public health protection that traditional toxicology and government regulatory agencies do not fill. Drawing upon its computerized databases on endocrine disruption and coordination with researchers in the field of endocrine disruption, TEDX provides the very latest summaries of the state of knowledge and its meaning for human health and the environment. To date, no chemical in use has been thoroughly tested for its endocrine disrupting effects. 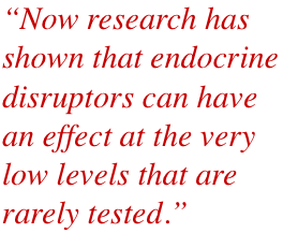 Traditional toxicological testing protocols were not designed to test for endocrine disruption and to test at ambient or low exposure levels. The Walt Disney Corporation, in a letter to Greenpeace in 2003, said that “the Walt Disney Company is always concerned with quality and safety”. Greenpeace decided to test that statement, so – as part of their campaign to show how dangerous chemicals are out of control, turning up in house dust, in household products, food, rain water, in our clothes……and ultimately in our bodies – they decided to test Disney’s childrenswear for the presence of toxic chemicals. Disney garments, including T-shirts, pajamas and underwear, were bought in retail outlets in 19 different countries around the world and analyzed by the independent laboratory Eurofins, an international group of companies which provides testing, certification and consulting on the quality and safety of products and one of the largest scientific testing laboratories in the world. We don’t have the space to fill you in on why each of these six chemicals is of grave concern, but please believe us – they’re not good. Any one of these chemicals can interfere with a child’s neurological development, for example, or can set the path for a cascade of health problems as they age. 1. Phthalates: Found in all the garments tested, from 1.4 mg/kg to 200,000 mg/kg – or more than 20% of the weight of the sample. 4. Lead: Found in all the products tested, ranging from 0.14 mg/kg to 2,600 mg/kg for a Princess T shirt from Canada. With Denmark’s new laws on the use, marketing and manufacture of lead and products containing lead, the Princess T shirt from Canada would be illegal on the Danish market. 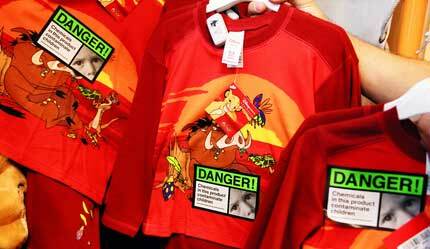 Canada has set a limit of 600 mg/kg for children’s jewelry containing lead – why not Disney T shirts? 5. Cadmiun: Identified in 14 of the 18 products tested, ranging from 0.0069 mg/kg in the Finding Nemo T shirt bought in the UK to 38 mg/kg in the Belgian Mickey Mouse T shirt. 6. Formaldehyde: Found in 8 of the 15 products tested for this chemical in levels ranging from 23 mg/kg to 1,100 mg/kg. One sample stands out: a German Winnie the Pooh PVC raincoat. This contained an astounding 320,000 mg/kg of total phthalates, or 32% by weight of the raincoat! This raincoat also contained 1,129 micrograms/kg organotins. 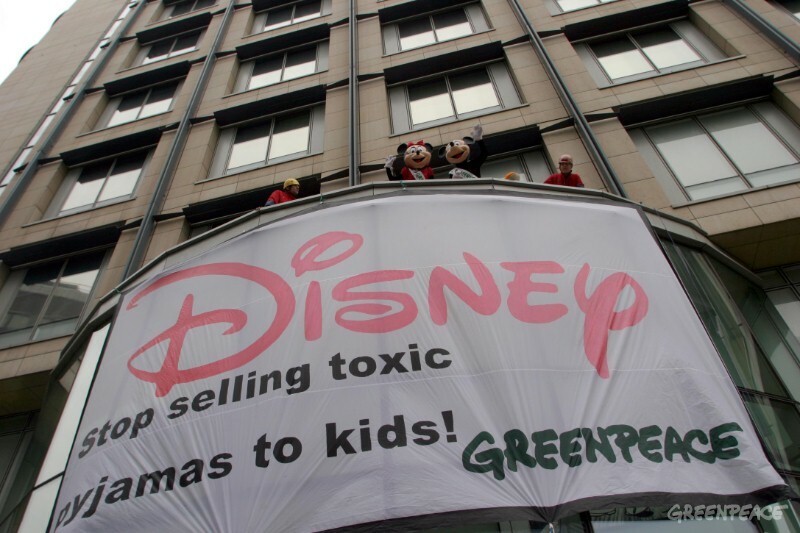 Greenpeace urged Disney to take responsibility for avoiding or substituting harmful chemicals in their products and to demand that their licensees implement a chemical policy that protects children’s heath. Disney reacted by stating that their products are in line with the law. The only action taken was to put labels on some products with a warning that those clothes contain toxic chemicals – but only in the UK (which has more stringent laws regarding chemical use than does the US), and only on a few items. Greenpeace Toxics Campaigner Oliver Knowles said, “”Their complete disregard for children’s health smacks of a Mickey Mouse company, and it’s now down to us to let the public know that these pyjamas contain dangerous chemicals. SAFbaby.com has asked a variety of children’s clothing companies whether their clothing contained formaldehyde. Disney responded that they comply with all Consumer Product Safety Commission (CPSC) regulations. But (as SAFbaby commented): CPSC has NO regulations set for formaldehyde levels, so that reply was not helpful to us in the slightest. We are not impressed with their follow up response to us. Disney’s refusal to be pro active in insisting their suppliers phase out hazardous substances demonstrates why voluntary initiatives don’t work. We support Greenpeace in asking that legislation to require mandatory substitution of hazardous chemicals with safer alternatives be put in place. Read the Greenpeace report on Disney’s childrenswear here. Can you wash or otherwise clean conventional fabrics to remove all the toxic residues so that you’d end up with a fabric that’s as safe as an organic fabric? It seems a reasonable question, and sure would be an easy fix if the answer was yes, wouldn’t it? But let’s explore this question, because it’s really interesting. Let’s start by looking at one common type of fabric: a lightweight, 4 ounce cotton printed quilting fabric. In this case the answer is no (and as you’ll find out, our answers will always be no, but read on to see why). 2. from the dyes and printing inks and other chemicals used to turn the fibers into fabric. Let’s first look at the pesticides used during growing of the fiber. Conventional cotton cultivation uses copious amounts of chemical inputs. These pesticides are absorbed by the leaves and the roots of the plants. Most pesticides applied to plants have a half life of less than 4 days before degredation. 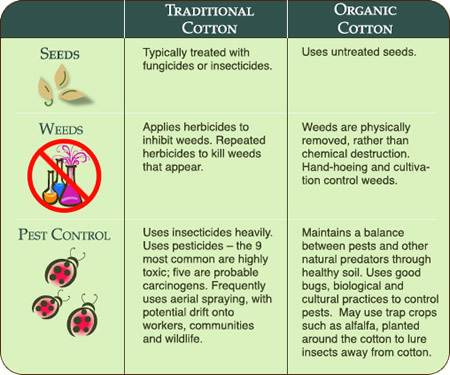 (1) So pesticides can be found in the plants, but over time the chemicals are degraded so the amount to be found in any bale of cotton fiber is highly depending on time of harvest and how recently the crop had been sprayed. Gas chromatography easily shows that common pesticides used on cotton crops are found in the fibers, such as: Hexachlorobenzene, Aldrin, Dieldrin, DDT and DDT. (2) Look up the toxicity profiles of those chemicals if you want encouragement to keep even tiny amounts of them out of your house. With time, as the cotton fibers degrade, these residual chemicals are released. If you’re trying to avoid pesticides which are applied to cotton crops, you’d do better to avoid cottonseed oil than the fiber (if processed conventionally) because we eat more of the cotton crop than we wear. Most of the damage done by the use of pesticides is to our environment – our groundwater and soils. Before we go further, let’s do away with the notion that organic cotton, woven conventionally, is safe to use. Not so. There are so many chemicals used during the processing phase of fabric production, including detergents, brighteners, bleaches, softeners, and many others that the final fabric is a chemical smorgasbord, and is by weight at least 10% synthetic chemicals (4), many of which have been proven to cause harm to humans. The chemicals used in conventionally processed organic cotton fabrics make the concerns about pesticides used in growing the crop pale in comparison: If we use the new lower chemical inputs that GMO cotton has introduced, it’s now possible to produce 1 lb. of conventionally grown cotton, using just 2.85 oz of chemical pesticides – that’s down from over 4.5 oz used during the 1990’s – a 58% decrease. So to produce enough cotton fiber to make 25 lbs of cloth, it would require just 4.45 lbs of chemical pesticides, fertilizers and insecticides. Processing that fiber into cloth, however, requires between 2.5 – 25 lbs. of chemicals. If we take the midpoint, that’s 12.5 lbs of processing chemicals – almost three times what it took to produce the fiber! There are over 2,000 different kinds of chemicals regularly used in textile production, many of them so toxic that they’re outlawed in other products. And this toxic bath is used on both organic fibers as well as non-organic fibers – the fibers are just the first step in the weaving and finishing of a fabric. (Make sure you buy organic fibers that are also organically processed or you do not have an organic fabric. An organic fabric is one that is third party certified to the Global Organic Textile Standard. ) Fabrics – even those made with organic fibers like organic cotton IF they are conventionally produced and not produced according to GOTS – contain chemicals such as formaldehyde, azo dyes, dioxin, and heavy metals. Some of the chemicals are there as residues from the production, others are added to give certain characteristics to the fabrics such as color, softness, crispness, wrinkle resistance, etc. And these chemicals are designed to do a job, and do it well. They are designed to NOT wash out. The dyes, for instance, are called “fiber reactive” dyes because they chemically bind with the fiber molecules in order to remain color fast. The chemical components of your fabric dye is there as long as the color is there. Many dyes contain a whole host of toxic chemicals. The heavy metals are common components of fabric dyes. They are part of the dye and part of the fabric fiber as long as the color remains. How do these chemicals get into our bodies from the textiles? Your skin is the largest organ of your body, and it’s highly permeable. So skin absorption is one route; another is through inhalation of the chemicals (if they are the type that evaporate – and if they do evaporate, each chemical has a different rate of evaporation, from minutes or hours to weeks or years) and a third route: Think of microscopic particles of fabric that abrade each time we use a towel, sit on a sofa, put on our clothes. These microscopic particles fly into the air and then we breathe them in or ingest them. Or they fall into the dust of our homes, where people and pets, especially crawling children and pets, continue to breathe or ingest them. In the United States, often the standards for exposure to these toxins is limited to workplace standards (based on limits in water or air) or they’re product specific: the FDA sets a maximum limit of cadmium in bottled water to be 0.005 mg/L for example. So that leaves lots of avenues for continued contamination! The good news is that there are fabrics that have been produced without resorting to these hazardous chemicals. Look for GOTS! Demand safe fabrics! (4) Laucasse and Baumann, Textile Chemicals: Environmental Data and Facts, Springer, New York, 2004, page 609.